World globes come in a variety of different sizes and styles while also being possibly manufactured out of different types of materials. The types and amounts of information located on each type of globe will vary as well. Even the colors may be different, depending on its intended educational or decorative use. If you are trying to choose between these many diverse types of globes, it might seem a bit of a challenge. But here are three simple steps that you should consider that might make shopping for an interesting world globe infinitely easier. Why are you buying a globe in the first place? In other words, what is its intended purpose? Are you using it for decoration? Will it be used as an educational tool for your children? Perhaps you’re using it in your professional business environment? Where many consumers fail is in assuming that all world globes are alike. Teachers will often use a globe in the classroom to discuss geographic principles and boundaries of countries. You might be surprised to learn that there are also other types of globes that are designed to show how the earth was divided into countries during other previous times throughout history. After all, in the 1400’s before Christopher Columbus landed in America, the world looked very different with very altered political boundaries. Of course, you don’t have to buy a globe simply for educational purposes. 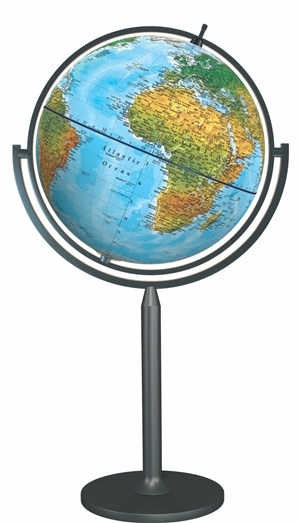 Many of these impressive round atlases can add a very decorative aesthetic to your room, home, or office. Thanks to the many advancements in manufacturing technology, you can now buy world globes that are transparent in background, that light up and illuminate, that sit on the floor, and even ones that function as hiding places for your wine and liquor. This type of globe is a great conversation starter, too. You can buy globes that talk, play games, and act as piggy banks for children of all ages. What type of theme you like best? As we stated earlier, there are many different types of designs, including modern, historical, novelty, and children’s versions. The modern world globes can take many forms, but perhaps the most common is the blue ocean globe with some other minor variations. Each individual country tends to be shown in a different color, with major cities, rivers, oceans, and capitals typically be shown as well. Of course, another type of modern style is oceans shown in black rather than blue. If you are going for a more vintage appeal, perhaps because you live in an older Victorian home, for example, then the historical themed “old world globe” might be a good choice. Very often these have the appearance of a parchment brown color, sometimes depicting famous discoveries, ocean routes, and other famous voyages that took place during a very specific time in history. The interesting thing about these types of globes are that the boundaries of the individual countries will look very different than they are today. These make a great choice for “history buffs” who spend hours and hours talking about World War I or the American Civil War, for example. Where are you planning to place it? Of course, if you have a very large room, then you might want to purchase a very large globe. But world globes come in a variety of different sizes, most generally between 3 inches to 24 inches in diameter. The average standard size of globes is 12 inches in diameter. So, as you can see, your options are nearly unlimited. Before you purchase, plan the precise location that you plan to place your world globe. Will it be placed on your desk? Will it be the centerpiece of a conversation area? Will it be placed in your den, doubling as a perfect hiding spot for your favorite Brandy or Cabernet? The average size for a floor globe is typically 16 inches in diameter, however these can increase in size significantly. Of course, as the size increases, so does the price in most cases. World globes are not only a wonderful educational tool, they clearly make wonderful additions to any interior space. A beautifully decorated home with an impressive antique style floor globe tends to lend a sense of worldliness and distinction to those who reside within the residence. Globes carry with them an inherent sense of knowledge and excellence, distinguishing the homeowner from other common men. 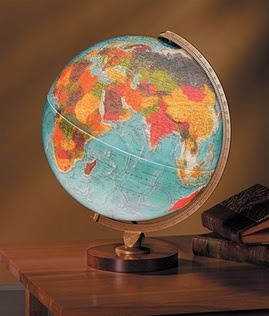 Whether you are a teacher in the classroom or simply a home decorator with excellent taste, a globe can make a terrific addition to any interior home or office. Check out our many selections and styles at http://www.ultimateglobes.com/.